Derry’s Carol takes stock in the Republic | Food NI - Our Food So Good! Carol’s Stock Market in Derry, a producer of natural stocks and beef bone broth, has won its first major business in the Republic of Ireland. The small manufacturing operation, established by Carol Banahan in 2016 and based at Derry’s Skeoge Industrial Park, is now supplying its range of award winning handmade stocks and bone broth to Independent Irish Health Foods headquartered in Cork. The company distributes a wide portfolio of food and drink to around 100 independent stores, including Avoca outlets, on the island of Ireland. Carol’s Stock Market, a Food NI member, produces natural beef, chicken and vegetable stocks and beef bone broth using locally sourced ingredients. It has won UK Great Taste Awards for its homemade products. Carol Banahan, originally from Dublin, returned to Ireland in 2014 after a successful career in investment banking in Canada. 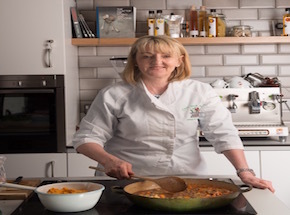 A cooking enthusiast, Carol set up her food production business with help of the Foodovation centre at the North West Regional College in Derry. Independent Ireland Health Foods is based at the heart of the West Cork Gaeltacht where it operates from a 24,000 square foot warehouse, where it stocks over 12,000 lines in various departments—prepacks, chilled, frozen, ambient (food and drinks), supplements, body care, household, gifts, lifestyle accessories and baby. It distributes products sourced from all over the world and categorised according to organic, gluten free, vegan and artisan sections to over 100 stores. It has a strong commitment to Irish-produced products. Customers include the majority of independent health stores in Ireland, as well as a large range of artisan, lifestyle and independent food stores, catering businesses, manufacturers and many more.